In a couple of weeks, little “Trick-or-Treaters” will be out in force across the neighborhoods of the land. Safety alert! First, it’s likely to be dark when they are out unless some of them start at dusk. Either way, it’s going to be harder for them to see than it is in daylight or total darkness. It’s going to be hard for motorists to see them also because some of the costumes or jackets are dark with no reflective properties. They are quite excited as the run from house-to-house, across driveways and even across the street to the other side. They are not looking for cars because this is not part of their agenda. We have to look out for them. Second, compounding the low-visibility that we have in trying to see some of the darker shapes and silhouettes of the children, the masks and costumes they are wearing may restrict their vision and their movement. Likely, they have never worn these costumes outside of their home previously. They aren’t sure how freely they can move or how well they can see out small eyeholes in those masks. We have to be extra diligent if we are out driving. Third, they frequently go around in groups so they aren’t necessarily looking out for their own personal safety but following the leader or the rest of the group – sometimes without thinking about what might be in their path. That brings us to visitability (we already mentioned visibility). Here we are concerned with hidden dangers, obstacles, and hazards that might be present in our yards that we might know about (or not), but in the dark are going to be partly or totally hidden by shadows, grass, or shrubbery. This applies to our own yards and those of our clients. Having a discussion with them or conducting a quick inspection of their front yards could avoid a potential issue. The grass is pretty, but when it gets a little taller (and at night) it can hide or conceal objects in it such as low-profile toys, garden hoses, yard tools, and similar objects. If we have been planting or doing other landscaping, there could be some holes that remain (that could be stepped in) or loose dirt. We can’t rope off our yards, so we need to take proactive, preventive steps to keep the children – and us – safe. We might have low hanging branches or tree limbs that we are aware of and that we can avoid in the daylight. Don’t forget those exposed tree roots or those that are prominent enough to be tripped over but not so visible as to be seen easily. Add in the darkness and people unfamiliar with our property, and these could be dangerous. Cut them back or otherwise attend to them before the “big day” arrives. This will serve us well also since we might forget about them or not see them as well either at night. 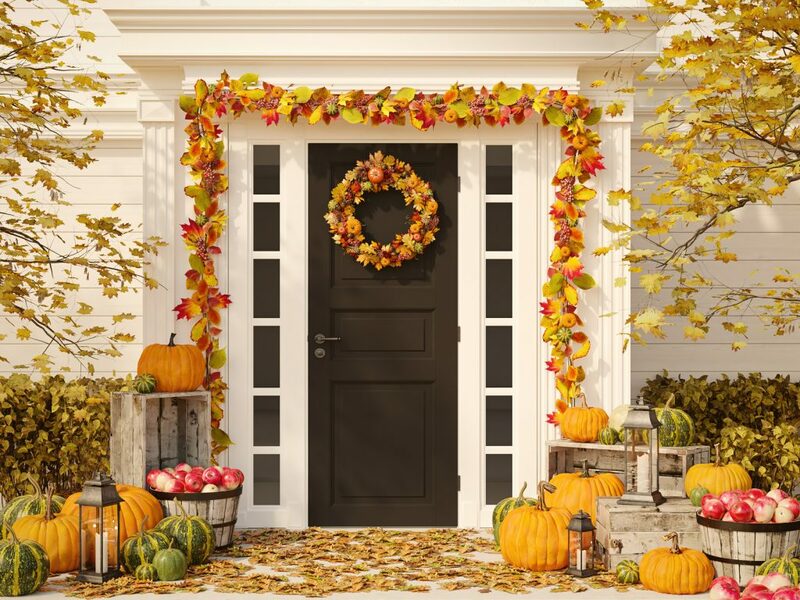 In an effort to get into the spirit of the Halloween and fall harvest season, many of us like to decorate the outside of our homes – very festive but potentially problematic. As long as the outsides of our homes are well-lit, people approaching our front or side door (for candy) can see where they are going – subject to vision issues of their costumes already mentioned. However, there are some other issues. The decorations that we use (pumpkins, hay bales, ghosts, cobwebs, Zombies, witches, scarecrows, corn stalks, bats, and squash), and then Pilgrims, cornucopias, vegetables, Santa Clauses, sleds, reindeer, Christmas trees, strings of lights, ornaments, and snowmen (artificial or real) for the rest of the holiday season, can easily crowd the walkway and narrow it. It provides visual confusion also for those trying to stay upright on a walkway that is unfamiliar to them. We are expecting people to visit us for the rest of the year – beginning at the end of this month. Not all visitors will be coming inside – the Trick-or-Treaters probably won’t. Nevertheless, the same rules and precautions apply whether people are entering our homes or just coming up to them. Safety needs to rule! If people can’t safely visit our property because of hidden or other dangers in the yard, driveway, or walkway, three things are going to happen – none of them good. One, we will get a neighborhood reputation, and possibly a local one that goes beyond the boundaries of our block, as the house to avoid (and not just at Halloween). Two, we risk having people visit us and having a potential fall, other injury, or a more serious fall because they tripped over something on our property. Third, we can become injured ourselves in our own yard!